It is never something that we expect to happen, but from time to time there may be a need to call in the professionals to get rid of casual intruders. 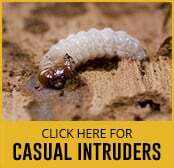 Casual intruders are unwanted creatures that for any one of a number of reasons infests your living space. Getting rid of the infestation can be tricky, and you can only be 100 per cent sure that you have entirely removed the problem, by using professionally trained personnel. Here are some of the most common Pests that can infest your home. This type of intruder can infest your property at any time of the year and is particularly attracted to damp conditions. The woodlouse is a slow moving insect and will find it difficult to survive in warm conditions. The female woodlouse can carry up to 150 eggs in her pouch, so a problem can quickly escalate into a crisis. Entry points into your home include air vents, gaps under a door, or in damp firewood. 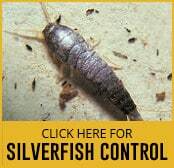 The silverfish is a casual intruder, which is common in lots of households and can cause significant concern, even though they don’t have pest status. They enjoy damp conditions, and groups will tend to scatter when a light is switched on. The female can lay around 100 eggs over a three month period, and the young can take a full year to arrive at full size. Their preferred food is bookbinding pastes, books and powdered foodstuffs. They are found mostly around skirting boards, cracked bathroom tiles and door frames. The body of a centipede is flat, with a lot of segments that have legs attached. This insect can grow up to 60mm and is generally brown in colour. It has antennae and sensors at the rear. The female centipede can lay up to 40 eggs and will tend them until they are ready to be hatched. This animal is a meat eater and will digest mites and small insects. Their preferred habitat is outside, but they will often go inside houses to seek shelter. However, inside is not an environment that is suitable, because they will dry out, and this will lead to desiccation. They do not like daylight and will scatter when disturbed. They are found under paving stones and stones. 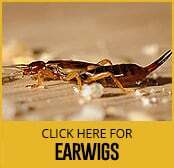 The earwig can be seen virtually everywhere, and if there is an infestation, then it needs to be dealt with using professional pest control. There is a myth that an earwig will attack a human’s eardrum, but this comes from its habit of seeking out dark holes if disturbed. This Pest is easily recognised because it has big forcepts at the tip of its abdomen. They are useful because they will destroy aphids, but also dangerous because they can transmit plant virus infections. Up to 80 eggs, can be laid by the female, and new generations will appear in July. The preferred food of this Pest is dead animals, insects, and plant matter. The habitat is usually outdoors, and they can be located under debris, and stones, and in vegetables and flowers. They prefer to be outside but will venture inside and seek-out floorboard cracks, and skirting boards. This is a very small insect with scales and a humpback. The springtail can propel itself into the air, by using its tail, which is how it gets its name. For pest control, they are not typically considered an enormous threat, but may eat seedlings, bulbs and seeds. You can find the springtail in greenhouses, and cool, damp conditions can produce vast numbers.